U-Line Echelon Wine Cooler Stainless (P/N 2175WCCS-00). U-Line understands that proper storage is critical for wine and has engineered all Wine Captain models to provide a safe and stable environment. This wine coolers offers wine storage capacity for up to 48 bottles, including a display row for your most prized bottles. 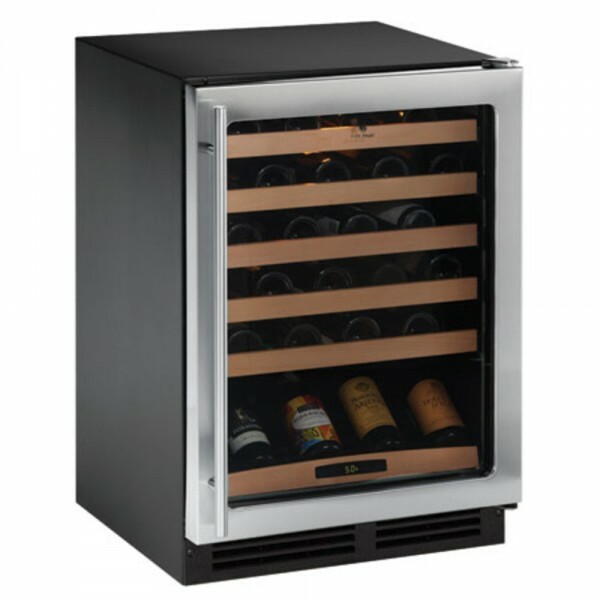 U-Line's unique triple temperature zone design adds versatility in storage, housing three different types of wine at their optimum serving temperatures, or safely storing a single type of wine throughout the entire cooler. Touch Control Digital Technology makes it easy to set and view internal temperatures, and full-extension sliding shelves provide convenient access to every bottle inside the cooler. Can be used in built-in or freestanding applications. Options include choice of finish, hinge side and door pulls (stainless finish only). Designed to impress and inspire anyone with an interest in wine, a U-Line Wine Captain provides wine cellar conditions for small wine collections and/or additional storage space for collectors with extensive collections.